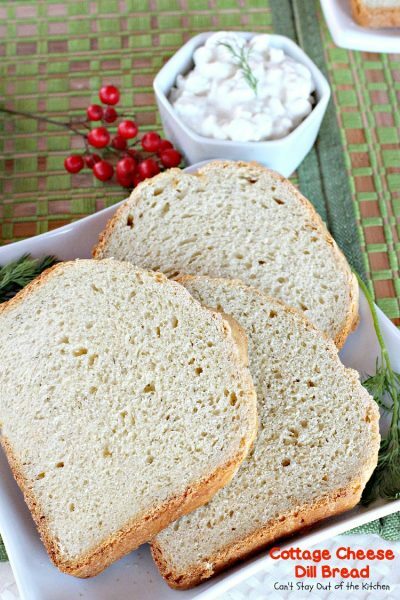 Cottage Cheese Dill Bread is another excellent breadmaker recipe that came with my Black and Decker breadmaker when we bought it a few decades ago. 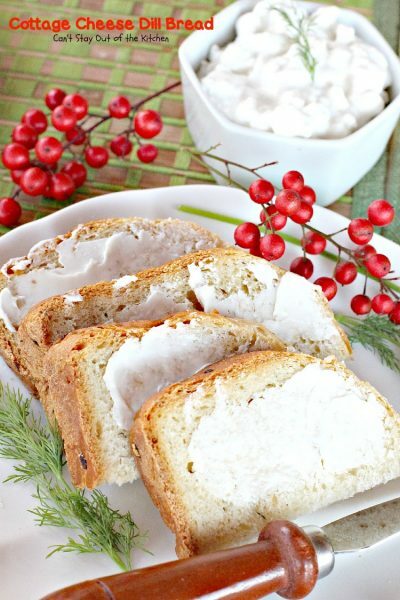 It’s got great flavor and it’s a wonderful dinner bread filled with cottage cheese, dill weed, and onions. 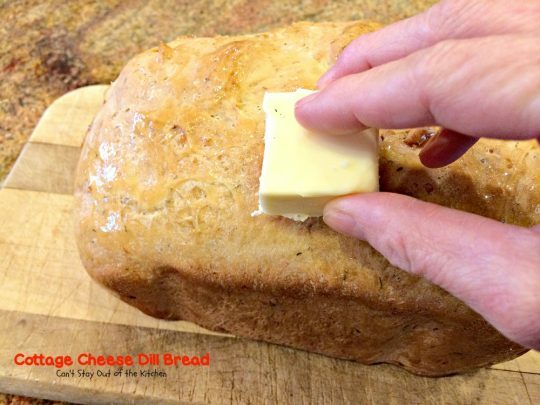 While this dinner bread is great to serve with butter, it’s also a nice bread to serve with dipping oil as you enjoy your favorite pasta. I love the flexibility of breadmakers. 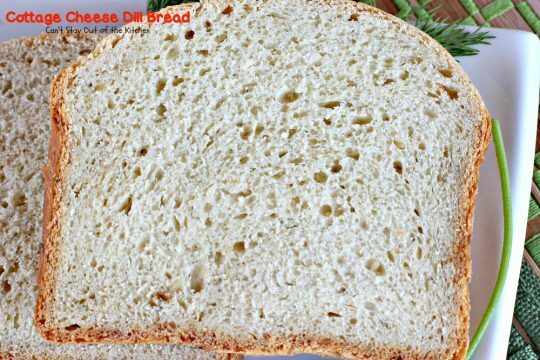 I can pop the ingredients for a loaf of bread in the breadmaker in 5-10 minutes time and, in a few hours, out comes a great tasting bread. 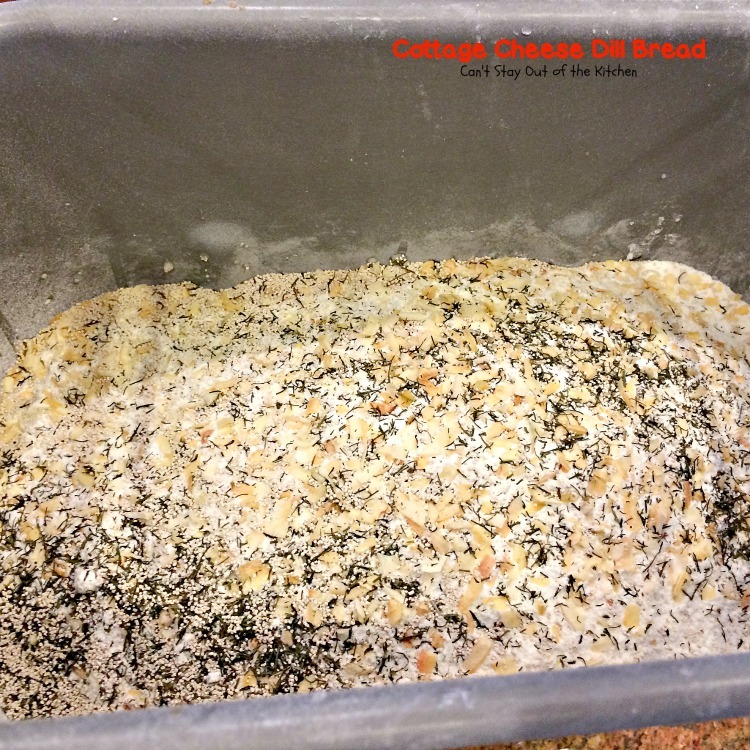 It’s especially easy to throw a loaf in the breadmaker for meals I’m taking to others. I made this loaf for the family of a new mom in our church last week. It was so quick and easy. I keep most of the stuff on hand regularly to make bread in the breadmaker. The only thing I had to buy for this recipe was the cottage cheese. While I don’t always have time to knead my own bread, this option certainly is a quick and easy way to have delicious homemade bread without all the effort and fuss involved in starting from scratch. 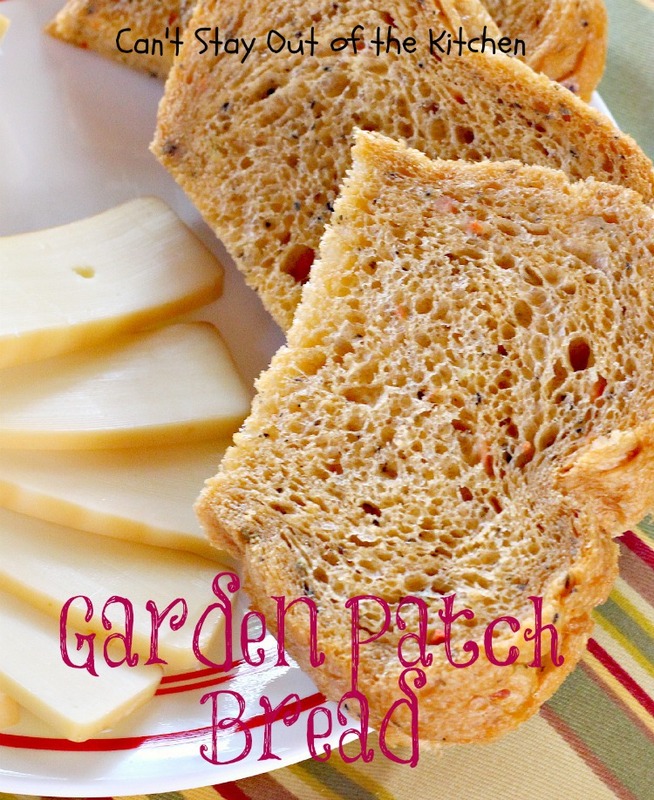 If you’re looking for a great dinner bread for a 2-lb. loaf breadmaker give this recipe a try sometime. The flavors are remarkable. 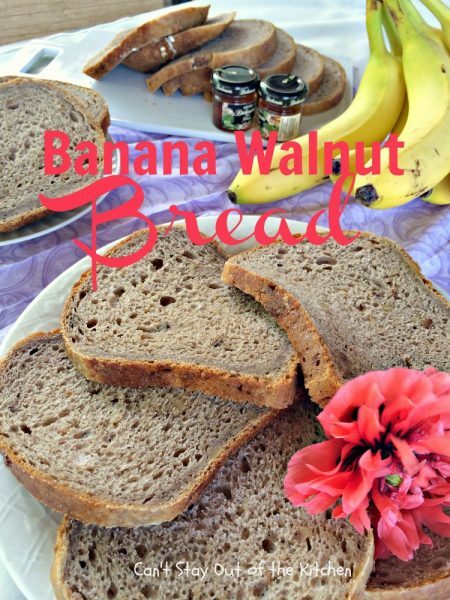 When I initially posted this recipe in March 2013, it was right before I purchased my good Canon camera. My pictures were taken on an inferior iPhone 3 or 4 and inside my house which has such a dark tinting on the windows (because of our Texas sun) that I don’t get enough light. As a result, the pictures were less than what I would really like to use for presentation. I recently remade this recipe (February 2015) and shot a few new pictures so you can get a better idea of what this recipe looks like under better lighting and with a better camera lens. This is still one of our favorite homemade breadmaker breads! Here’s a look at Cottage Cheese Dill Bread after I’ve sliced it down in halves and spread with butter. 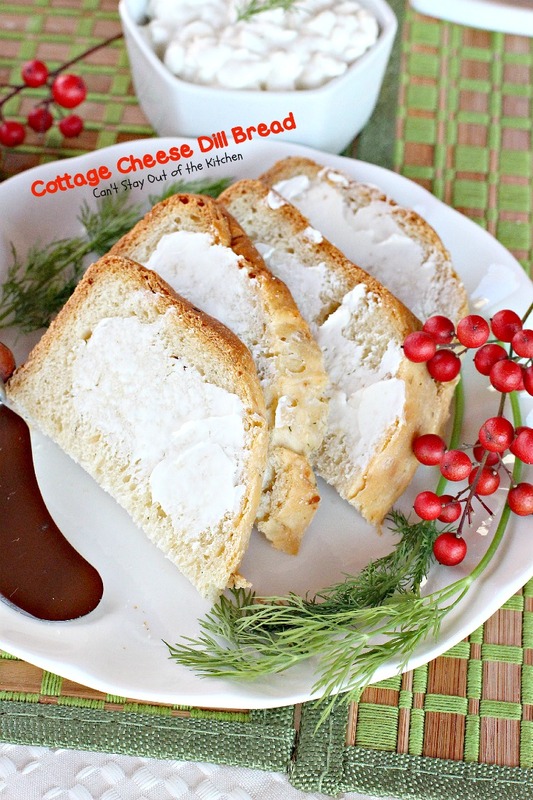 Cottage Cheese Dill Bread is a quick and easy bread that’s made in the breadmaker. Cottage Cheese Dill Bread is a great bread for dipping in olive oil with herbs too. Place some olive oil, freshly ground black pepper, parsley, and any other seasonings you desire in a small bowl or on a plate and dip away! Or you can always eat the bread the old-fashioned way with lots of butter. Measure hot water and pour into breadmaker loaf canister. 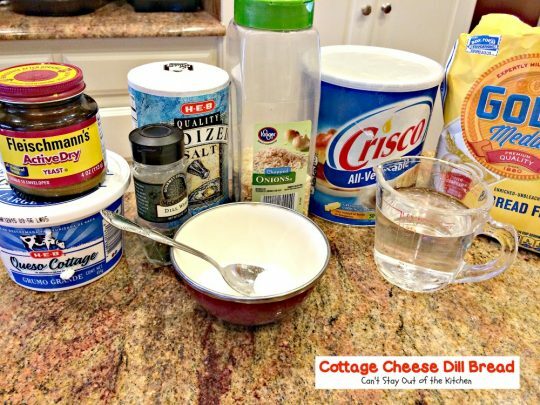 Add cottage cheese and stir to combine. Add Crisco shortening, sugar, salt or sea salt and bread flour. Bread flour has more gluten so the particles of bread will adhere together better and not get crumbly and fall apart. Regular all-purpose flour does not have as much gluten. Add dehydrated onions, dill weed and yeast. Allow bread to sit in canister about 15 minutes to cool. Remove from canister. Butter the tops and sides of the loaf to prevent hardening. 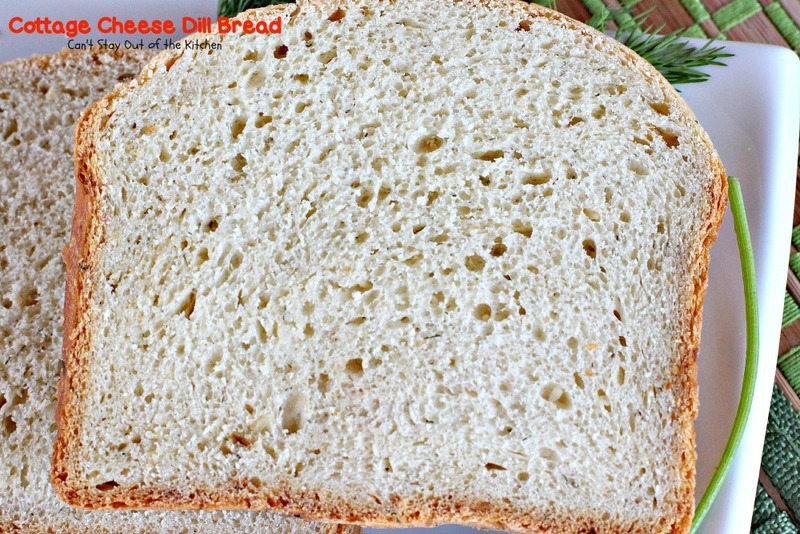 Allow bread to rest another 15 minutes before cutting down into slices. Slice down and serve. I’ve found that an electric knife yields the best results. 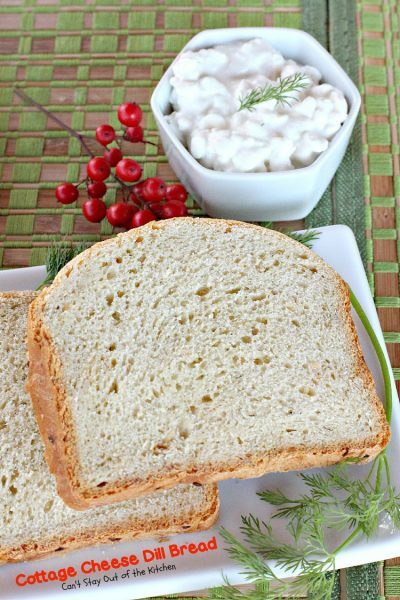 Cottage Cheese Dill Bread is a great side dish for any pasta recipe. Each 2-lb. loaf makes about 15 slices. Tasty homemade bread made in the breadmaker. This one uses cottage cheese, dehydrated onions and dill weed. Makes a 2-lb. loaf. Measure ingredients in order given and place in bread canister. Turn breadmaker oven on regular setting. Mine takes about 3 1/2 hours to bake. 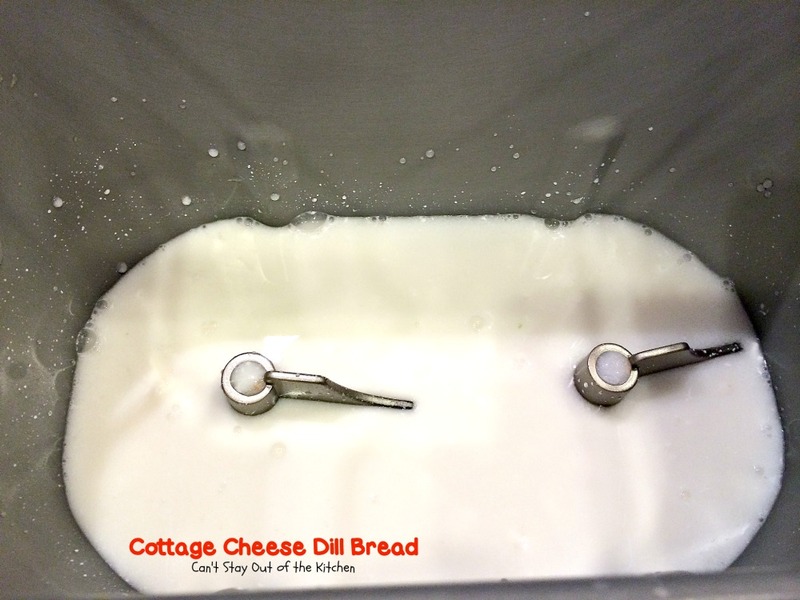 Allow to rest in canister about 15 minutes before removing bread from pan. Butter top and sides so crust doesn’t get tough. Yield: one 2-lb. loaf – about 15 half slices. NOTE: Homemade bread can only sit out on your counter for a couple of days. After that it needs to be refrigerated because it has no preservatives and will get moldy more quickly. Homemade bread can only sit out on your counter for a couple of days. After that it needs to be refrigerated because it has no preservatives and will get moldy more quickly. Here’s a slice of bread for you! 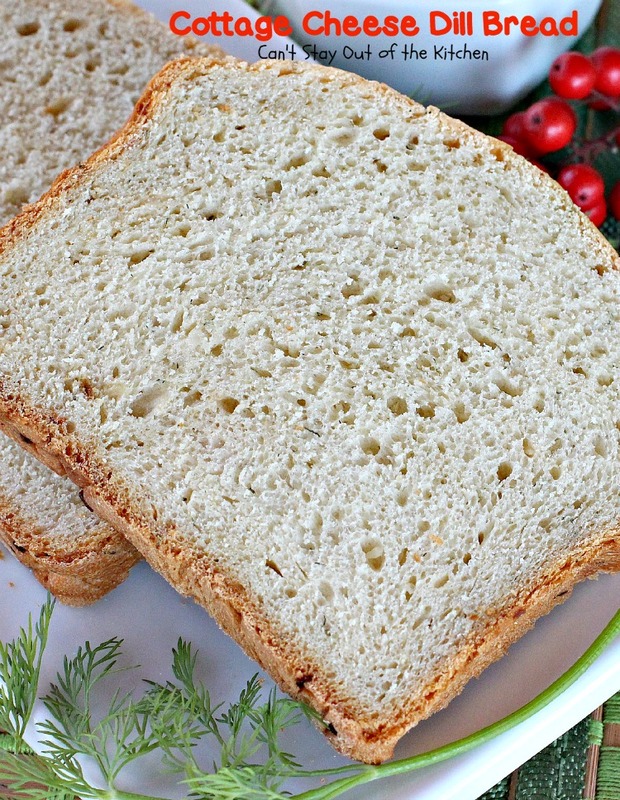 We love the convenience of breadmaker bread. 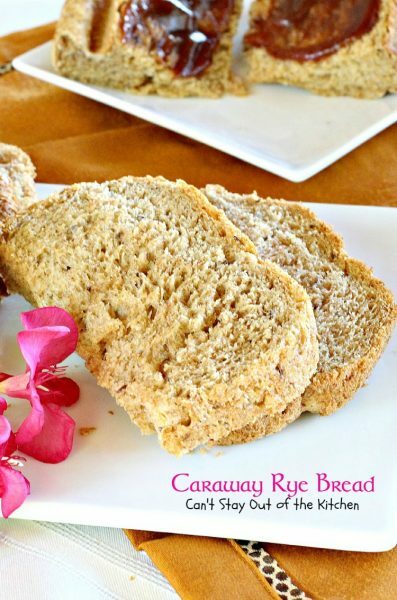 You get the wonderful taste of home-baked bread without all the work. Cottage Cheese and Dill Bread is also good slathered with butter! You can even add a little apple butter. It’s yummy that way.